Report Card for Mary Johnson Sent to Orange Johnson from the Worthington Female Seminary, Second Quarter 1841-1842 from the collections of the Worthington Historical Society (WHS) may be used for educational purposes as long as it is not altered in any way and proper credit is given: "Courtesy of the Worthington Historical Society, Worthington, OH." Prior written permission of the WHS is required for any other use of Report Card for Mary Johnson Sent to Orange Johnson from the Worthington Female Seminary, Second Quarter 1841-1842. Contact WHS at info@worthingtonhistory.org to request permission. Report Card for Mary Johnson Sent to Orange Johnson from the Worthington Female Seminary, Second Quarter 1841-1842 is text, with genre correspondence. Its dimensions are 10.25 in. x 3.75 in.. It was created around 1841-1842. Worthington Female Seminary is the Creator. Worthington Historical Society is the Contributor. C. L. Parsons is the Author. 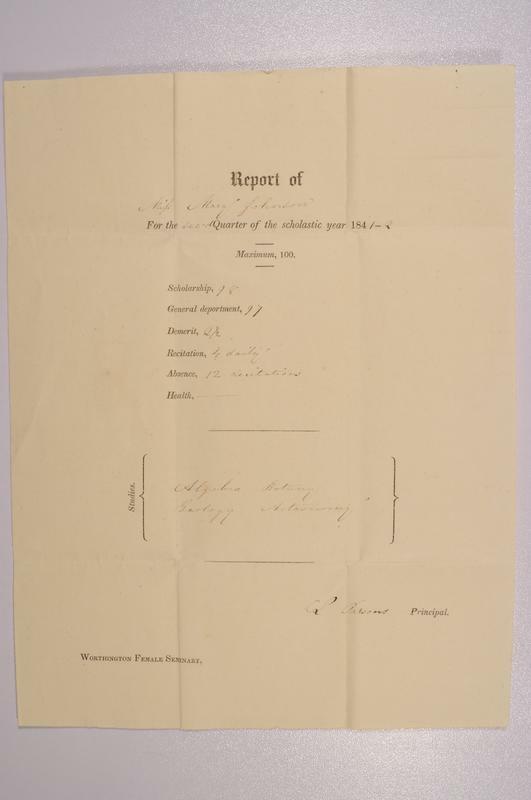 This report card details Mary Johnson's classes and grades during second quarter of the 1841-42 school year at the Worthington Female Seminary. It was sent to her father, Orange Johnson, by C.L. Parsons, principal of the school. The subjects she studied during the quarter were Algebra, Botany, Geology, and Astronomy. The Worthington Female Seminary's charter was granted March 9, 1839, and the school was built in 1842. It was the first female seminary of the Methodist Church in what was then considered the "West." After the establishment of the Ohio Wesleyan Female College in 1853, the Worthington Female Seminary lost support, closing in 1857. It covers the topics history, schools and Orange Johnson House. It features the people Mary Sessions (née Johnson), 1823-1919, Orange Johnson, 1790-1876 and C. L. Parsons. It features the organization Worthington Female Seminary. The Worthington Historical Society identification code is 2012.0005.97. The Worthington Memory identification code is whs0992. This metadata record was human prepared by Worthington Libraries on May 30, 2017. It was last updated October 13, 2017.